Functionality has become increasingly important with new printers, and I don’t just mean GUIs and slicing software. The FABtotum is also a milling machine and 3D scanner, and the Bukito is portable. But there was one function missing: 3D faxing. 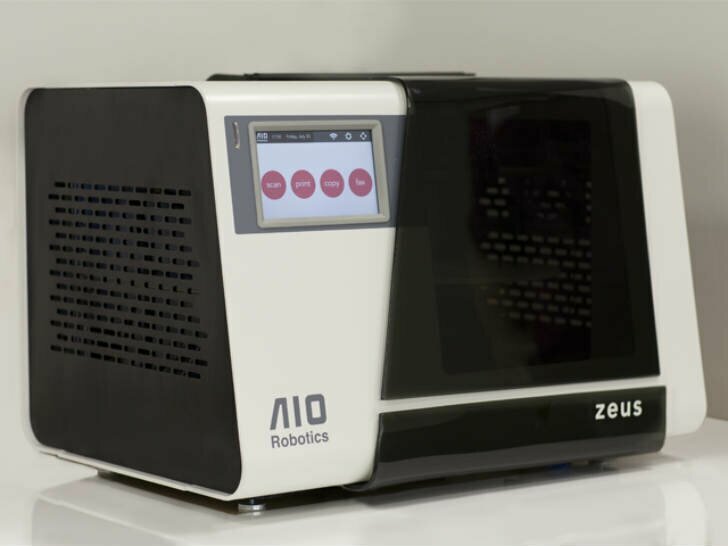 And the ZUES on Kickstarter can print, scan, copy, and fax. I have to say this looks like an amazing machine. The concept is wonderful, 3D faxing, but the execution looks just top notch. AIO Robotics have really outdone themselves with the engineering and build of the ZUES. Having the printer platform double as the scanning turntable is incredibly convenient, and autocalibrating with a Z probe is the only way to make that feasible. And the autocalibrating ties in with the no-setup faxes. The recipient of a fax doesn’t have to do anything but approve the print; the software handles all the slicing and printing settings. This is intended to replicate the ‘out of the box’ experience that office electronics offer. There are not many left at that price though, and it’ll be $2499 after those early birds are gone. It’s a great deal at either price as it’s cheaper than a MakerBot Replicator 2 + Digitizer.